A handy directory of top career coaches who let you try before you buy. Why do top athletes have coaches? Simple: to get better results, faster. Similarly, in 6 Reasons You Might Need a Job Search Coach Now, job seeker coach Rita Ashley said that having a coach helps in “securing a better job, reaching it faster and gaining the intangible benefit of control over” your job search. But then, how do you find a good career coach who can get you that? You could try googling ‘career coaches near me', but where you live will largely decide how useful that is. Plus the fact that a career search coach is local in no way guarantees they're any good. You could try asking your network of contacts for recommendations, and if you're lucky, someone you trust will actually be able to speak from experience. But what if they're in a different industry, or at a different stage in their career? 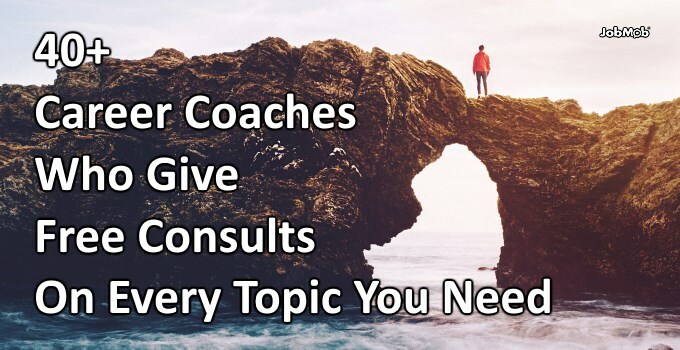 It's not so easy to find the best career coach for you, which is why I've compiled this list of career coaches from around the world who offer a free consult upfront. Most of the coaches here offer initial phone or Skype consult calls you can use to explain your situation and discuss their coaching services and pricing, while some give free resume and CV reviews. Use the free call to see if there's good chemistry with the coach to be, and try to understand if you'd enjoy working with them. Have you ever had a paid coach of any kind? 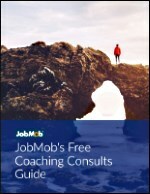 Free bonus: Download JobMob's Free Coaching Consults Guide which contains a directory of coaches offering free consults, and a list of the top questions to ask them during those consults. Based in: Asheville, NC (USA) and works nationally. Based in: North Carolina. Sharon has a virtual practice and serves other cities around the USA. Target audience: Consists of mid-career changing professionals who want to advance in their jobs or make a career change. I work with my clients virtually, so I work with clients across the country. I assist clients from most industries including Government, Non-profit, Corporate and Higher Education. Target audience: job seekers – people who have been made redundant or are looking for a new/better job, they know what they want but don’t know how to get it; career changers – people who are not happy in their current career and want to make a change but don’t know what to; and people who want to achieve life goals, such as relationships; and leaders who want to improve their leadership skills. They are Sydney-based. Target audience: executives, directors, managers, and professionals in southern counties of England. Target audience: school leavers and adults who are looking for a career transition. Target Audience: mid-career professionals who want to take the leap to a new career, a new job or moving up faster in their current job or career. Target audience: anyone who wants to discover what their most fulfilling career and job would be and a way to achieve it. This is a creative, individualized 4 step process. It works best with people willing to determine what they’d like first, and then figure out what they need to do to get there. It’s not a good match for people who want to start with their skill set and see who’s asking for that set. It’s also not for people who prefer to use standardized assessments. Can meet in-person if in Twin Cities, Minnesota area. Target audience: “helping professionals since 2009 and has now helped hundreds of happy clients to find their next role, make big career changes, start businesses, develop confidence, get promoted and noticed, and much much more. Target audience: Ideal for people in their 20s, 30s, and 40s who want to change careers, reenter the workforce, get promoted, or upgrade their job search for better results. My innovative, 6-step Career Map helps career changers design a perfect-fitting career that's customized to your unique life situation. And my 4-step Job Search 2.0 is customized to accelerate your job search results, no matter what your industry. Target Audience: professionals, from early career through executive level, who are going through or will soon go through a career transition. They’re considering another job or are thinking about freelancing, consulting, or coaching. They want help developing a resume/CV and online profile that attracts ideal opportunities and emphasizes personal brand/uniqueness. If they’re job hunting and not getting much success answering online ads, I advise them about more effective search strategies. I also coach them on interview preparation, leveraging my past experience as a professional recruiter. Target audience: We are international company with websites in 12 countries servicing anyone that requires our services in English, German or French and we work with anyone of any age, looking to further their career. Target Audience: Those who want to help themselves take control of their careers, short, mid and long term. Our clients come from all industries and range from recent top talent graduates wanting to invest in their career map, to global CEO's seeking highly tailored executive 1-2-1 board support. If you've used a job hunting or career coach in the past, what was most helpful? If you haven't used one, what was the main reason why? Tell us in the comments. Thanks for including me, Jacob – I’m honored to be on the list!